Bucking Sheep Hire. A hilarious alternative to a Rodeo Bull. 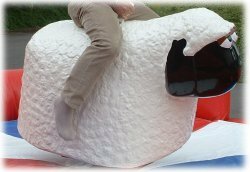 Our Bucking Sheep ride is a different slant on the normal rodeo ride and is one of the most hilarious forms of entertainment you'll see! Guaranteed to have both the rider and spectators laughing out loud. There's no age restriction on this ride although all riders must be at least 4ft tall. The ride is always operated by our trained operator on your behalf and each ride is timed automatically with a trophy provided for the longest ride of the event. The Bucking Sheep can be operated indoors or outdoors. The ride requires a space of 17x17ft and 9ft height clearance for indoor events. If outdoors and using the inflatable shelter that we provide free of charge you'll need 23x23ft. All access points need to be at least 33inches wide in order for the equipment to pass through. If you have any queries, questions, or would like to hire the Bucking Sheep Ride please call us on the number below or click to enquire and we will do all we can to help.